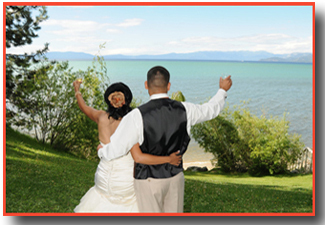 Regan Beach is a very popular venue and is a great year-round wedding location in South Lake Tahoe. One of the main reasons for its popularity other than the natural surrounding beauty is that it is centrally located in town for easy access and convenience for you and your guests. Also, this beach locality has a designated area that’s used specifically for summertime events, and with acquisition of a site permit it can be reserved for a private wedding. The private section of Regan Beach is a perfect outdoor wedding venue that emits an ambiance of serenity and repose. 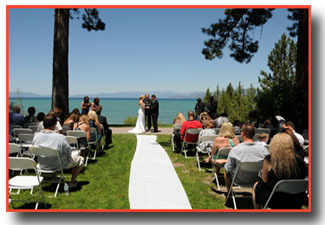 The area consists of a park-like setting overlooking Lake Tahoe with your ceremony taking place on a grassy knoll under the tall, 100 year old Jeffry Pine trees. It is a spacious area, and up to 150 guests can be accommodated. Further welcoming benefits include ample free parking, nearby restrooms, and it is handicap accessible. A reservation and site permit for Regan Beach Park can be acquired for your wedding date through services provided by Alpenglow Weddings. Once a permit is secured, chairs can be arranged for your guests (at additional cost) in addition to an arch or any other decorative notions you may have for your wedding ceremony. For small groups of up to ten or fewer people, you may choose to have your ceremony on the sandy beach along the shoreline as an alternative to the grassy knoll. Please be aware, though, that this option is not a private setting and that putting up chairs or decorations on the beach is not allowed. However, since this spot is intended for a simpler, informal service with minimal guests, we offer a discounted rate. Because this area is accessible to the public, the best times to have the ceremony are mornings or very late afternoon to avoid summer crowds. This principally applies to weekends throughout the summer season. Upon reserving Regan Beach Park’s designated area on the grassy knoll for a specific date and time via permit procurement, your reservation will include two hours of private use by you and your guests. If on a budget, rental of this venue may prove to be cost-effective if you’re planning on having a celebration following the ceremony because this wedding site is multifunctional, which means you can host the banquet there if you desire, avoiding costs of obtaining another facility. Portable tables can be erected for catered food, cake cutting, or champagne toasting. With appealing traits conducive to commemorating an exceptional day, this delightful location is suited for both small and large groups and appropriate for relaxed or formal apparel. * Discount available for small groups of ten or less. Discount available for larger groups off-season.